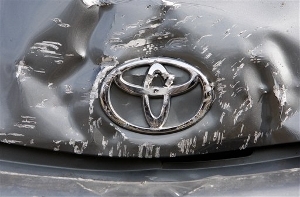 If I were a Toyota owner (I am NOT), I would still be a little apprehensive about whether Toyota really has fixed the problem with millions of their cars. The latest scare, yesterday in California, involved a runaway PRIUS, with the driver having no brakes and the accelerator stuck at speeds of up to 94 m.p.h. The 911 call is harrowing. Now Federal Regulators in the Department of Transportation are investigating a similar crash in New York that occurred on Monday. The driver of the car told police that the car accelerated on its own, then lurched down a driveway, across a road and into a stone wall. This brings into question whether what Toyota is doing to “fix” their rather severe problem is really the solution, or whether Toyota is simply trying to pass it off as fixing the problem. I am skeptical, but as a plaintiff’s personal injury attorney in Georgia, I am skeptical about alot of things. Toyota Owners: BE CAREFUL! !